Unable to update this object in Microsoft Online Services, because the attribute Username is not valid. Update the value in your local Active Directory. This is because as part of building your Hybrid environment, you’ll introduce Exchange 2010 servers into your environment as your Hybrid co-existence servers, running both the Client Access, Hub Transport but not the Mailbox role. When running the pre-requisite Active Directory Preparation a Discovery Search Mailbox, used in Exchange 2010 for storing the results of multi-mailbox searches. However the reason why it isn’t included within an Exchange 2007 hybrid environment is because the mailbox is never enabled – Discovery Search mailboxes do not exist in Exchange 2007. So as a “standard” user object, DirSync attempts to export it. Unfortunately, it’s not possible to enable the Discovery Search mailbox with the correct type from either the Exchange 2007 management console (you’ll just enable it as a normal mailbox) or the Exchange 2010 Hybrid Servers (you don’t have Exchange 2010 mailbox servers). What you can do though is simply delete the Discovery Search Mailbox from the Users container of Active Directory. 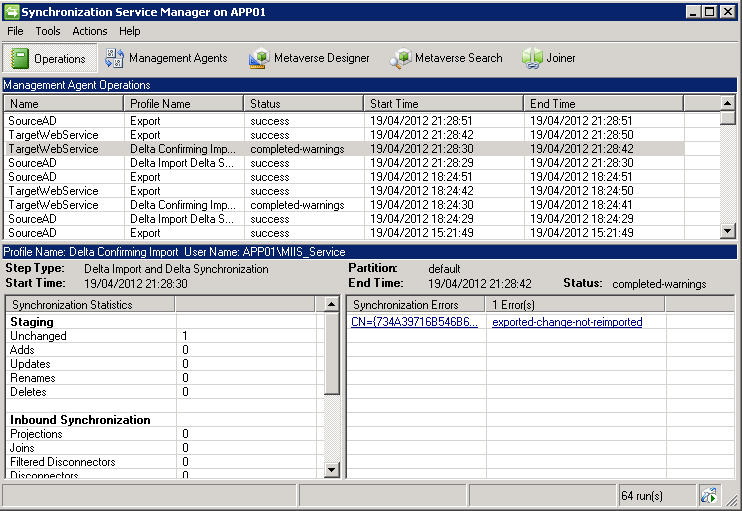 Re-creating the Discovery Search Mailbox if you install Exchange 2010 Mailbox Servers into your Hybrid environment. And at this point, because you’ve got Exchange 2010 mailbox servers and enabled the Discovery Search Mailbox correctly (which will set the msExchRecipientTypeDetails attribute in Active Directory) you won’t see any DirSync errors either.